A forward is an OTC agreement between two parties to buy or sell an asset at a pre-agreed two parties to buy or sell an asset at a pre-agreed price at any pre-agreed future date. A futures contract is listed contract, traded on a futures exchange, to buy or sell at a certain date in the future, at a pre-agreed price. 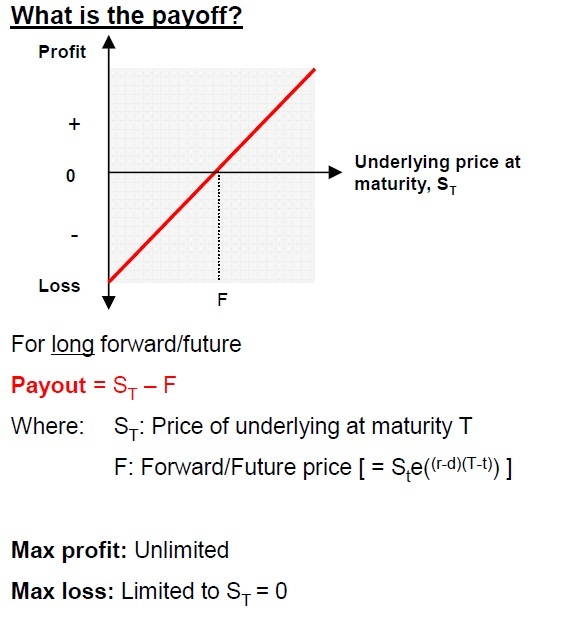 No actual cash/asset exchanged until maturity of the contract, where P/L is realised in cash. Forwards are then settled at the forward price agreed on the trade date. Initial margin paid to the exchange and P/L exchanged daily on mark to market.Variation margin may be exchanged on losses/gains. Position can be closed out at any time by taking an opposite e.g. short the same future. At expiry, either physically settled or cash settled. The final settlement price for a future is often a special quotation (EDSP) which may or may not be the same as the closing price that day. Orginally used by farmers to guarantee a cetain price for their crop (selling futures before harvast). Also used by consumers of commodities to fix costs in advance (e.g. livestock farmers buying food futures). Used by investors who wish to hedge out the risk of an underlying asset/derivatives through the futures market. Used by speculators who seek to make a profit by predicting on paper for which they have no practical use. However, standardized futures contacts are very liquid and often therefore trade for reduced margins.